Meet ‘Super Eagles’ Babatunde & Mojeed: the new members of the Trediberri team! Leaving their family & friends behind in Nigeria, in mid 2016 twenty-six year olds Babatunde (“Tunde”) & Mojeed (“MJ”) made the trek to Libya, meeting there & becoming friends in one of the many holding camps. The boat they then subsequently took to cross the Mediterranean capsized, unsurprisingly, with Mojeed saving his friend, Tunde’s life. On finally arriving at Lampedusa, they split up: Babatunde journeying to Forli, Emilia-Romagna, while Mojeed ended up in L’Aquila, Perugia. 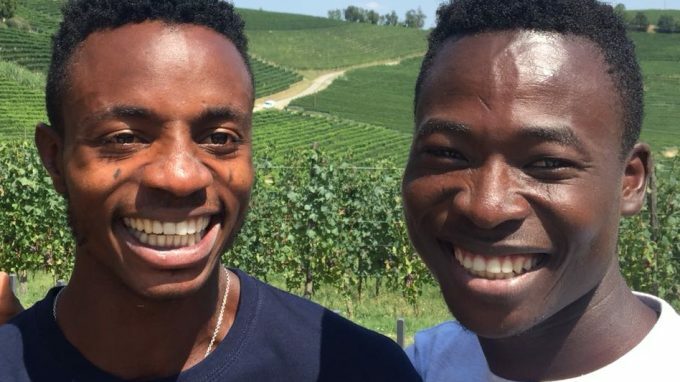 Reunited via facebook, Babatunde was fortunate to have then met one of Nicola Oberto’s family, who suggested there might be a possibility of work in Trediberri’s vineyards. Tunde travelled over to the Langhe & was employed by Nicola’s family in January 2018, with Mojeed joining his friend last month. They now tend the Nebbiolo vines of Trediberri’s Rocche dell’Annunziata! Babatunde now plays for a local Alba football team, in attack, while Mojeed – happy in defence, midfield or attack – is on the look out for a new squadra! Meet Super Eagles Babatunde & Mojeed!